Woman needed a tag team that could finish the job she started on Rick and Scott Steiner. She believes she's found it in Doom, a mysterious 565-pound masked fighting force that's become the hottest new team in the NWA! "Well done, gentlemen," cooed Woman. She was in her glory as she led her masked tag team known as Doom back to the locker room after beating Rick and Scott Steiner at "Halloween Havoc '89" on October 28 in Philadelphia. "To think, we beat the Steiners in our first match ever! It just goes to prove what I've said all along: The Steiners are nothing. 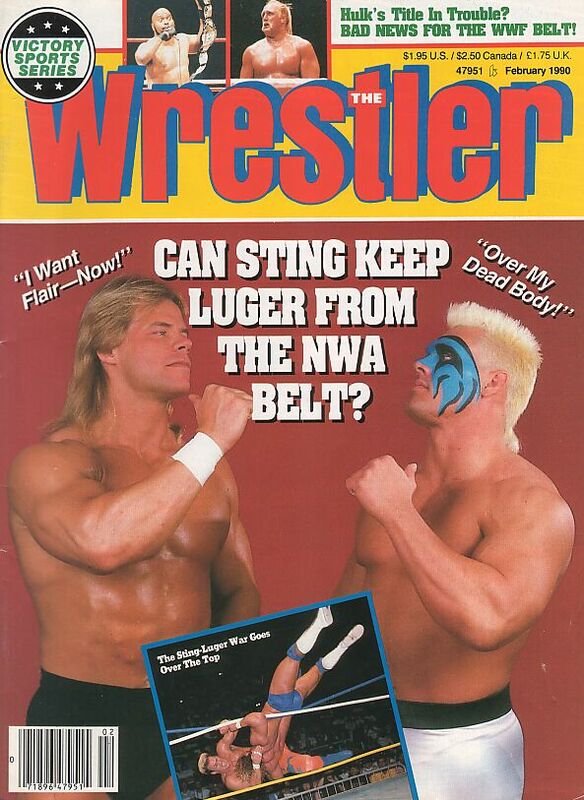 And now Doom will become the greatest tag team in NWA history." Rick Steiner, however, begged to differ with his former sweetheart's summation of her hooded giants. "Those guys cheated," Steiner fumed, hurling his amateur headgear to the floor in disgust. "The only reason that big Doom dude could pin me was because he stuffed his mask with something and knocked me out with it. I can't wait to get my mitts on those guys again, 'cause I've still gotta get my revenge on Robin...er, I mean Woman." Although Steiner was correct in accusing Doom of breaking the rules, no one can deny that this 565-pound team is an impressive new force. Both men stand 6'2", and check in at 285 and 280 pounds, respectively. But who are these massively muscled men? What are their names? Their backgrounds? Why did Woman select them as her first proteges? But that's not really all that is known about Doom. From the way they wrestle, it is clear that these two men are not rookies. One man displays an incredible variety of suplexes and slams, while the other seems to prefer a straight-ahead brawling style. It's apparent that these men have been schooled very well. "You can thank me for that," insists Kevin Sullivan who, for a short time, was the only other wrestler in Woman's stable. "One day, Woman brought me these two massive, muscular men, and I couldn't believe my eyes. These two guys have the kind of power that can rival The Road Warriors and The Skyscrapers. All they really needed was someone to show 'em how to really get down and dirty-and nobody knows how to do that better than I do." Amazingly, Woman's callous attitude toward those who have helped her soon came into play once again. She had hired Doom and Sullivan to take part in the now-infamous limousine attack on Scott Steiner in late September. But by the time "Halloween Havoc" came around, Sullivan had mysteriously disappeared. "We don't need to talk about that," said Woman. "Doom is all I'm worrying about now. They are the most loyal, attentive men I've ever met." Indeed, both Doom members are at the beck and call of this unscrupulous vixen. Neither man will speak unless she allows it. On top of that, almost all the ring maneuvers they use are ordered by Woman. During the "Halloween Havoc" match, she saw that both of her men were in danger of losing their match against the Steiners. Seeing Rick distracted, she loaded one of her men's masks with what appeared to be a piece of metal. One headbutt later, Doom scored its first victory ever-in front of a national television audience. "And this is just the beginning," Woman warned. "Now that we have humiliated and humbled the Steiners, we have bigger and better things in mind-much bigger. I believe we can beat The Midnight Express. I know we can decimate The Dynamic Dudes. And we are nearly ready to challenge Michael Hayes and Jim Garvin for those World belts. All we need is a bit more experience." Rick and Scott Steiner see things a bit differently, however. They'd like nothing better than to ground Doom's career before it gets a chance to flourish.